Why is it that there is so much talk about creating buyer personas and yet I often see little evidence that they are utilised effectively to improve the bottom line and increase conversion rates? Creating buyer personas make a lot of sense but rarely do they appear to be discussed when companies create website optimisation programs. 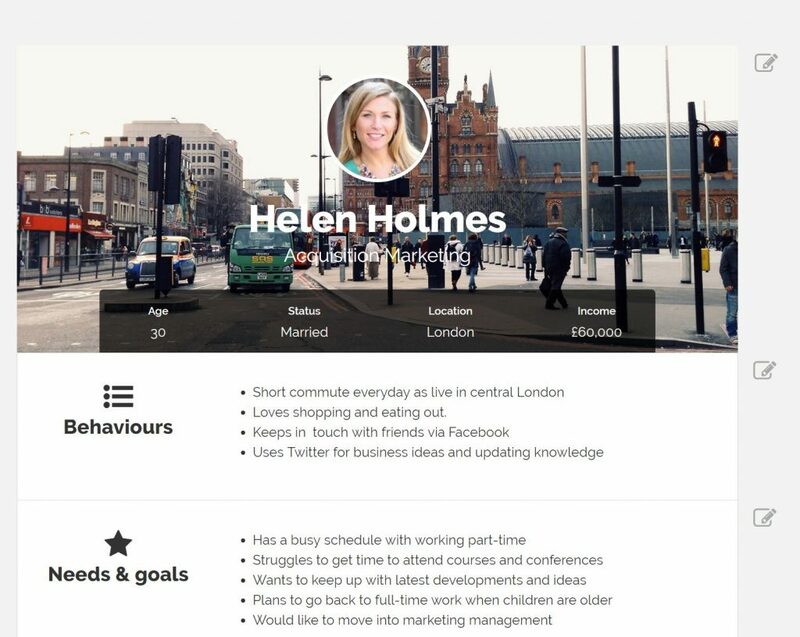 Rightly or wrongly personas appear to be primarily the domain of UX people rather than optimisation teams. This represents a missed opportunity for conversion optimisation as when used wisely buyer personas can help identify the gap between your brand narrative and the actual user experience. Such analysis can be invaluable for creating targeted content and for developing ideas for A/B test hypothesis and general improvements to the user experience. how an innovative approach by Bryan and Jeffrey Eisenberg to customer journey analysis utilises personas to their full potential to improve conversions. A persona is a detailed portrait of the characteristics, needs, motivations and environment of intended or important user segments. It should include their name, age, career, income and other relevant characteristics such as their goals and values. Personas should not be made up of the average customer as there is no such thing as an average user. Averages are dangerous when employed for design or creating a user experience. They are overly influenced by extremes and don’t reflect the diversity of customer behaviour and needs. Personas can be as simple or complex as you want them to be. The important thing is that you use data you hold on customers and interviews with customers or prospects to build your personas. The biggest mistake people often make is that they assume they already know who their customers are, what goals they have etc. You don’t need a large budget to create a buyer persona as you can gather data on customers yourself and group your findings in a spreadsheet. There are many sources of data that you can use apart from customer account information. If you have the data analytics tools you can identify customer segments using cohort analysis or other data reduction techniques such as cluster analysis. Look at your web analytics as the Audience section in Google Analytics has information on demographics, interests and geographical location and language. Contact your Customer Service agents as they talk with your clients on a daily basis and check out social media to see what they say and look at their profiles. Find out where your customer hangout (e.g. online forums or societies they are members of) as again there may be a wealth of free information available here. Use descriptive headings that relate to your area of interest, such as device, time of day, behaviour and career goals. As you build up data on different characteristics or behaviours you will start to see patterns emerge that could suggest relationships between the profile make-up of customers and their needs and motivations. Don’t just look at demographics as often behaviour is the most important characteristic of individual customer segments. However, these patterns will help you begin to identify customer clusters that you can investigate to understand what they have in common and how they differ from each other. Now that you have an idea of potentially different customer segments you should get out and interview a small sample of customers or prospects who roughly fit the profiles you have so far. Ideally you should go and meet customers in their natural environment (i.e. where they normally browse your or your competitor’s website) as much of our behaviour is contextual and observation is often more insightful than asking direct questions. 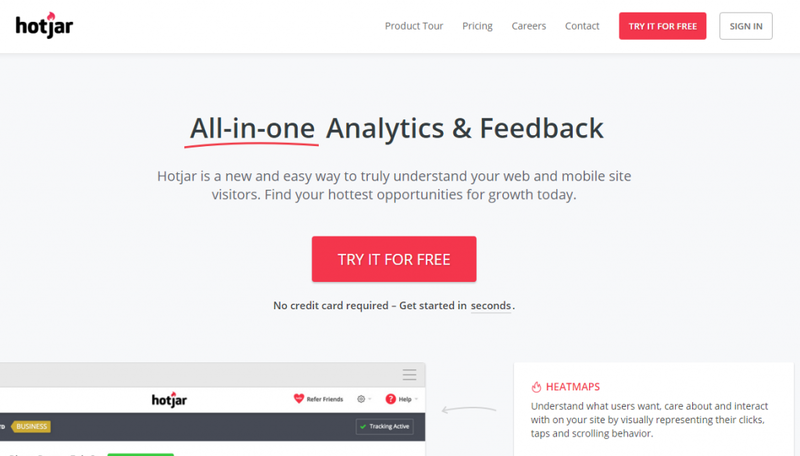 If for whatever reason you can’t visit your customers there are many low-cost Voice of Customer tools, such as Hotjar that allow you to recruit customers when they are on your website. You can then arrange for a Skype call or web meeting to conduct your interview. Draft a short discussion guide to ensure consistency of your interviews, but ensure you keep most of your questions open-ended to allow users to express their opinions. If you give them a task to complete you can ask them to give a running commentary as they browse. This can help you better understand how they behave and identify potential pain points in your user journey. You may also pick up on the language they use for your sector. Add this information to your spreadsheet to give more depth to the personalities of your customer segments and their buying style. Building personas is an iterative process and so your customer interviews are bound to result in some changes to your segments. However, try not to create too many different segments unless you have evidence that each is reasonably large and important to the sustainability of your organisation. 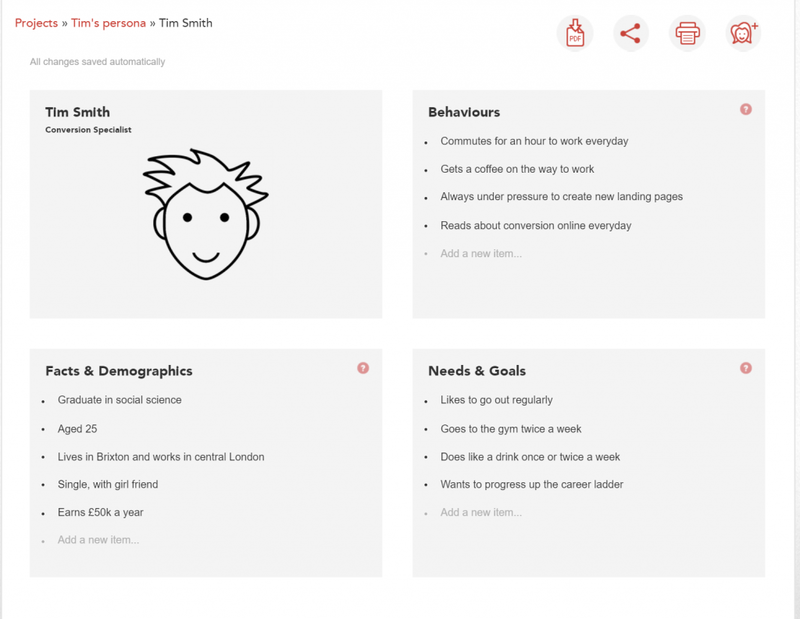 There are a number of free persona creators and templates available to use. I have summarised 7 persona templates in a separate post. It’s essential that you share your personas to get any benefit from the effort of creating personas. Use a suitable template to to present your persona in a professional format. 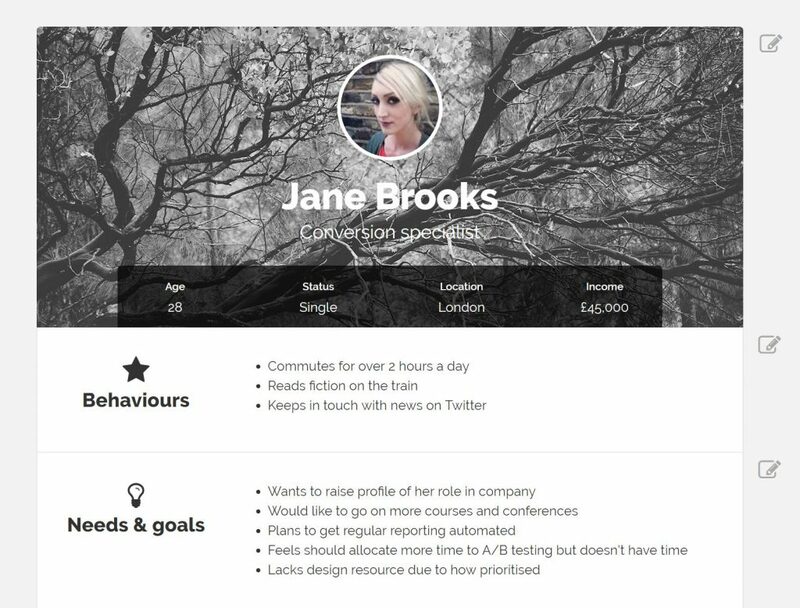 How can I use personas to improve conversion? Personas need to be shared throughout an organisation if they are to have a significant impact upon how people think about your customers. However, they also have an important role to play in your optimization program. Conversion experts Bryan and Jeffery Eisenberg have created an agile business process for using personas that improves communications, execution, testing and makes more money for your organisation. Rather than following the normal approach of customer journey analysis of going down the happy path (i.e. the preferred user journey), they suggest assuming your prospect failed to convert with your brand. This allows your team to focus on what can go wrong rather than how great your preferred user experience is. This is a team exercise so get stakeholders from all key areas that influence or control the user experience together in one place. Make sure you get the support of key stakeholders first as this often helps to obtain cooperation from different departments. Firstly consider the buying style of your chosen buyer persona. It is important to define this as it will influence how your customer responds to the user experience. Normally it is a good idea to begin with a enquiring, deliberative, detail type personality as they are most likely to uncover issues with your user journey (which is what you want). It is also necessary to choose a conversion objective so that you have clarity on the end-goal. 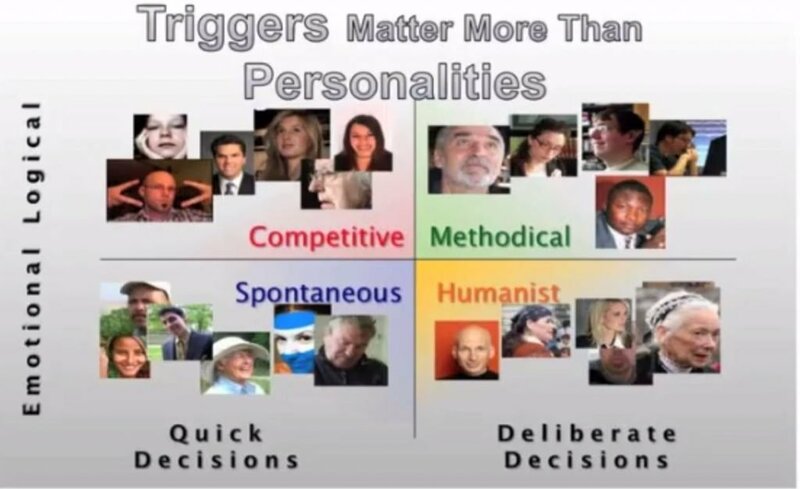 Below you will see the four buyer styles based upon the work of the American psychologist, David Keirsey. The pre-mortem involves evaluating the customer journey on the basis that the customer did not convert with your brand. This gives everyone permission to raise doubts and concerns about the current user journey so that you can generate a list of what went wrong with the existing customer experience. Relate any frustration, wrong turn or dead end back to your chosen persona by imagining what would happen, how would the customer feel about it and at what point would the issue result in the customer dropping out of the conversion journey. Once you have gone through the full customer journey focus on generating a list of possible changes, fixes or solutions for each failure point. They may not always be ideal, but they can be evaluated later on in the process. Now describe the user story using reverse chronological order to work backwards from a successful conversion. This has the advantage that you have to be more thorough in specifying customer actions and their rationale for each step in the user journey. It also helps you view possible alternative user paths generated from the pre-mortem analysis. These may require additional interventions or new branch paths. What actions need to be undertaken for the customer to complete your goal? What opportunities may have been missed? What shortcomings of the user journey might prevent them from purchasing? Where are their opportunities for upsell or upgrade? How could we reduce friction in the user journey to make it easier for the customer? Buyer legend 1. Person Use the persona to describe who the customer is. 2. Their purpose What are their larger goals? How do they define them self? What are they trying to accomplish on a larger career-wise, personally or socially? 3. Objective of interaction What are they trying to achieve by dealing with company? 7. Emotional struggles What are the emotional dynamics – strongly felt need, pressure from others, trust, time vs money? 9. Constraints Any additional constraints or limitations that the customer has to consider? 10. Alternative options What alternative options does the customer have? What would an experience with a competitor look like? Ensure the legend is easy to read as this will help everyone follow the story line. 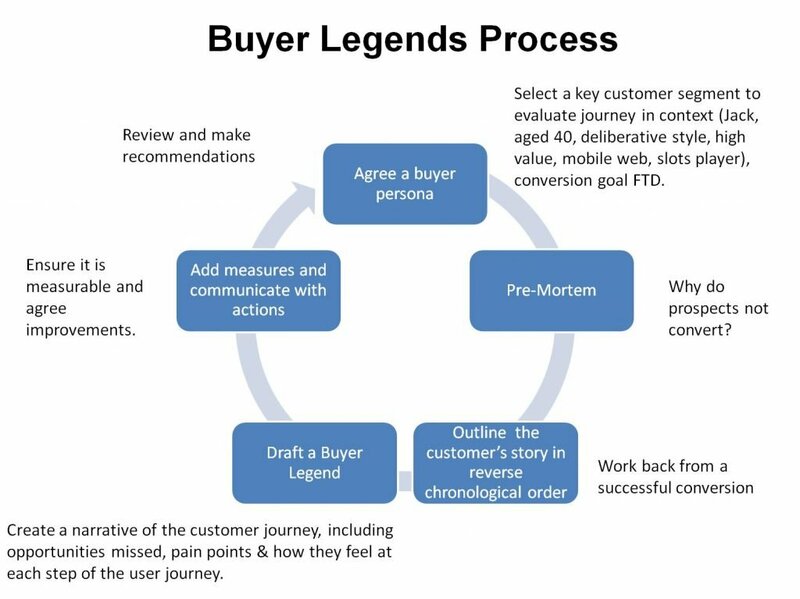 To ensure the Buyer Legends is measurable and actionable here are some important definitions to use during the process. Catalyst: This refers to the place where the customer first identifies your brand or organisation. First measurable step: Usually a landing page, but this is the point where you customer enters the measurable part of the journey. Road signs: These are important stages in the user journey where customer expect and require certain information to continue with the process. Detours: Many customers will not blindly follow your preferred user path and so it is necessary to construct paths to deal with these forks in the road as otherwise customers may abandon your website and never return. 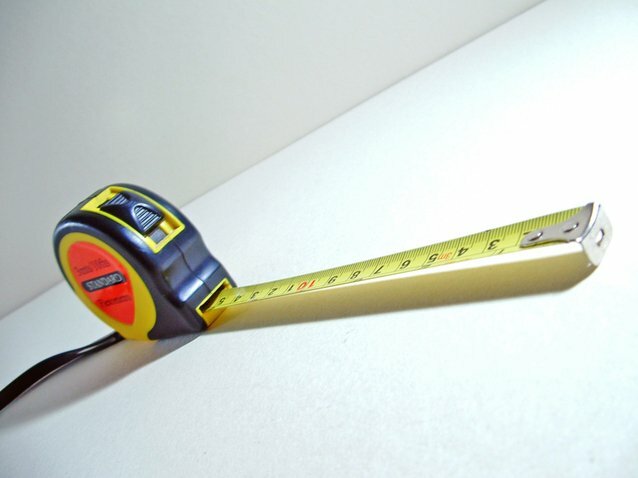 Measurable step: Whenever a customer leaves behind evidence of an interaction (e.g. via web analytics) with your brand. Forks in the road: Decision points create forks in the road where customers have a specific question, need or concern that can lead them away from the desired path. People don’t like being forced down a path if they are not comfortable with it and so it is essential to create detours that can nudge the visitor back down the preferred path. Destination: The end game and final measurable touch point where the user converts. Use these definitions to help dissect your Buyer Legends and generate discussion around potential improvements in the user journey. Going through this process will undoubtedly generate lots of ideas and discussion along the way. Ensure you capture these ideas and insights so that they can be fed into your optimisation program. Helps everyone see the user experience from the customer’s perspective. Enables marketers, designers and other teams to visualise and better understand how the user experience differs for individual customer segments. Allows marketers to consider the language your customers use to ensure content resonates with your target audience. Segment content by different personas using the Buyer Legends to identify their specific concerns and hooks that motivate them most. Improve the quality of content marketing as the Buyer Legends process brings out the personalities and interests of customers. Identify missing content, steps or dead ends in the user journey that need your attention. It is likely that you will have many more ideas than you can cope with and so it is worth using a prioritisation approach such as P.I.E to manage the flow of ideas and allocate resource accordingly. Once you have completed this process with one persona you can repeat it for other buyer personas to further enhance your understanding of key customer groups. For more details about Buyer Legends get the book; Buyer Legends by Bryan & Jeffery Eisenberg with Anthony Garcia. Although it requires a good deal of thought, and it will take some time to complete, it is definitely worth the effort as you should see substantial benefits for your organisation. If you need help in going through the journey yourself contact Bryan or Jeffrey via Twitter or go to the Buyer Legends website. About the author: Neal provides digital optimisation consultancy services and has worked for brands such as Deezer.com, Foxybingo.com, Very.co.uk and partypoker.com. He identifies areas for improvement using a combination of approaches including web analytics, heuristic analysis, customer journey mapping, usability testing, and Voice of Customer feedback.